Google has just started rolling out the new OTA update for Nexus 6 Android Smartphone, the latest update comes with build number LMY47Z for the Sprint, US Cellular and International variants and another build is LYZ28E For T-Mobile only. The OTA update size is around 120 MB and very soon Nexus 6 users will get this update. 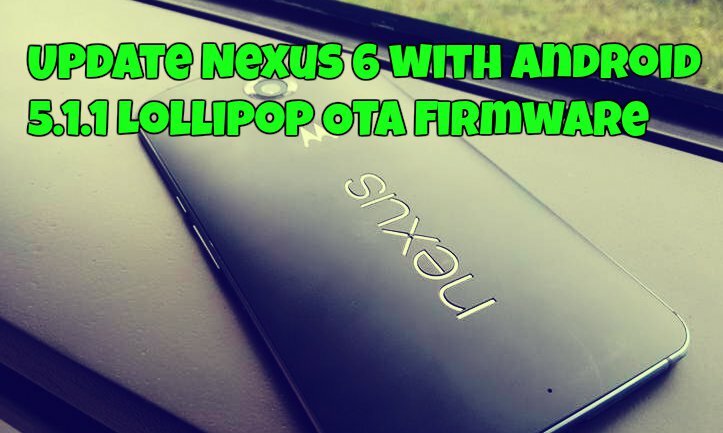 As the OTA updates takes some time to reach the users, and if you can’t wait for so long and want to install this OTA update manually on your phone, here is the complete step by step guide which you can follow on your desktop and update nexus with Android 5.1.1 Lollipop. Before following the below mention guide, make sure that you’re on the LMY47D build (Sprint, US Cellular and the international variants) while the T-Mobile US variant users should be on LMY47M. And don’t try this update on any of other devices. Step 1. Download and install the USB drivers for Nexus 6 on your PC here. Step 2. After this, you need an ADB and Fastboot files to run the ADB commands on your windows PC. Download ADB and Fastboot file here. and extract the folder on your desktop. And rename the downloaded file to update.zip and paste in the ADB folder that you downloaded in step 2. Step 4. Connect your Nexus 6 to the PC and make sure the device is detected by the PC. Step 5. Now open the ADB folder and open a command prompt by pressing Shift + Right-click on any empty space inside the folder, and select Open command window here from the context menu. Step 7. Once your Nexus device boots into the Recovery mode, press Volume Up for a second, and release it. Now you’ll be able to see the recovery menu. Step 8. From recovery, use the Volume Down button to highlight apply update from ADB and hit the Power button to select it. Step 10. Now the update process will start on your Phone and wait for few minutes to complete it. Step 11. Once the update is completed on your Nexus 6, it will restart automatically and boot to normal mode. Now your Nexus 6 is running on the Android 5.1.1 Lollipop update.